Rakusan did not include the Fan Series in his main sequence numbering. Therefore, the original number used for each of the 36 Series prints has been modified to identify the Fan Series members of its theme. The five different fan silhouette shapes have been here assigned arbitrary numbers 1 through 5. To indicate a fan design these shape designations are added to the 36 Series number separated by a hyphen. 125-2 is the Fan Series design with fan shape 2 in the 125 Pussywillow theme. Like all other designs in this series, 125-2 was only produced in a single print run, and few copies are currently documented. The 125 Pussywillow theme is one of the many entirely regular themes represented by a complete fan quintet and a color woodblock print. On the delivery folio for installment eight of the Fan Series in November 1934, Rakusan announced theme 125 as due to appear in installment nine in the following month, December 1934. However, it is not known if the installment nine was actually distributed in that month or was delayed. The woodblock prints were likely printed during the same month as their distribution. All five fan designs (including 125-2) have seal C, which indicates a carving date during the first half of 1934. Despite the early completion of those wooden blocks, Rakusan delayed printing and distribution of the prints in what became the 125 Pussywillow theme at least for several months. It was eventually grouped with other winter season themes nearer to the end of the series. However, the 36 Series design 125 has seal B which indicates a later carving period closer to the time of publication. 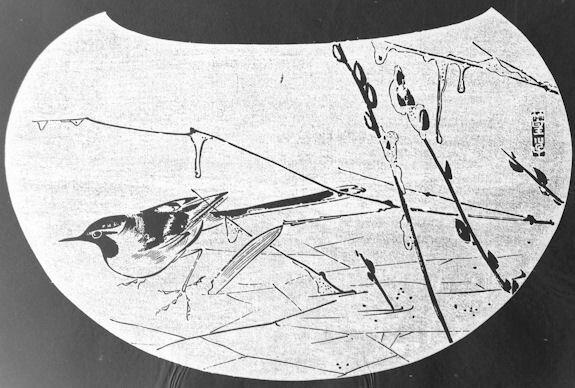 In the folio announcement Rakusan used the title 猫柳に鴫, nekoyanagi ni shigi, 'pussywillow and shorebird', which is actually applicable only to the 36 Series design 125. The only subject common to all of the designs in this theme is the pussywillow. Therefore, a more general title, the 125 Pussywillow theme is used here. 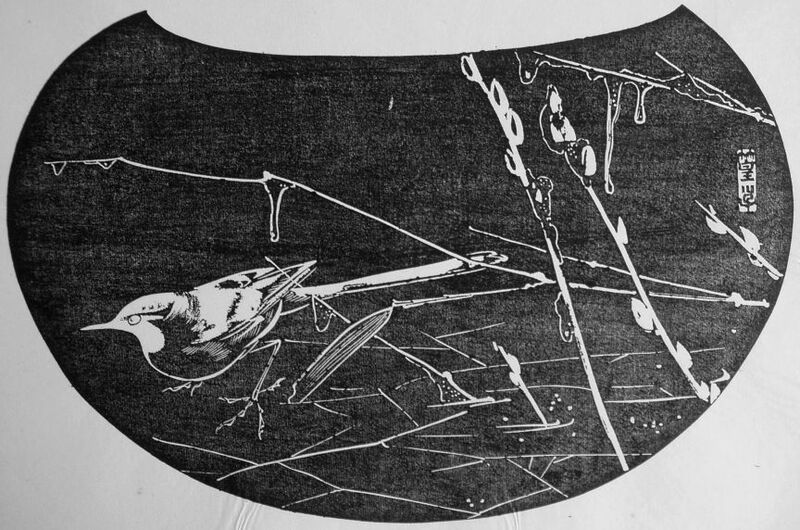 Some of these pussywillow designs were adapted from sketches originally created in the late 1920s during the planning of designs 83 and 86 in the earlier 100 Series (see below). . The composition of 125-2 includes a four branches of pussywillow and three of bamboo-grass with one of each emerging from the ice covering what is likely a small pond. The branches are covered with snow and icicles. Standing on the ice (indicated by angular lines on the ground) on the trunk is a wagtail. The entire composition is painstakingly carved so that the ishizuri version is an exact negative of the original sketch. Rosegold Pussywillow, Salix gracilistyla, 猫柳, ねこやなぎ, ネコヤナギ, neko-yanagi, lit. 'cat-willow' is a common native species in Japan. The variety name is based on the name for Weeping Willow, Salix babylonica, 柳, 楊, 楊柳, やなぎ, ヤナギ, yanagi, which is also used as a general name for any willow, much as in English. Rakusan was fond of willow motifs and used them in several artworks. Japanese Wagtail, Motacilla grandis, 背黒鶺鴒, せぐろせきれい, セグロセキレイ, seguro-sekirei, (lit. black-backed wagtail) is a common and distinctive Japanese bird.